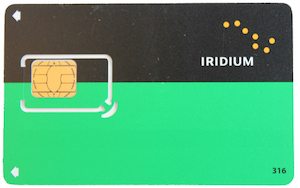 The Outfitter Advantage: The most popular Iridium Prepaid SIM Cards provide global service. 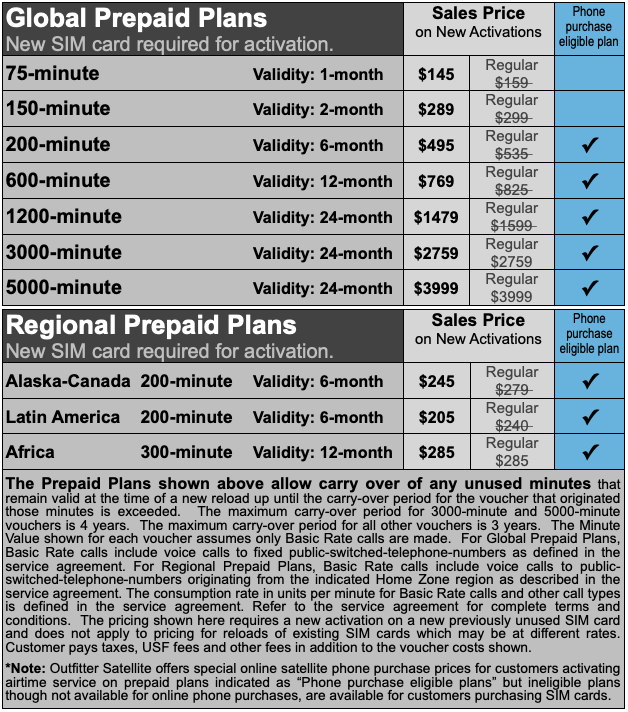 Very economical Regional Iridium Prepaid SIM Cards are available for Alaska-Canada, Latin America and Africa. Voicemail and data capability are FREE on all plans. Unused minutes can carry forward up to 3 years* from the original prepaid voucher purchase if the account is reloaded prior to the expiration date. Outfitter Satellite will send you a courtesy email notification prior to this expiration date. Reload painlessly on our online store. Alaska-Canada Home Zone covers the mainland of Alaska and Canada and 12-nautical miles into their associated coastal waters. Africa Home Zone covers Algeria, Angola, Benin, Botswana, Burkina Faso, Burundi, Cameroon, Cape Verde, Central African Republic, Chad, Democratic Republic of the Congo, Djibouti, Egypt, Equatorial Guinea, Eritrea, Ethiopia, Gabon, Gambia, Ghana, Guinea, Guinea- Bissau, Juan De Nova Island, Kenya, Lesotho, Madagascar, Malawi, Mali, Mauritania, Mauritius, Mayotte, Morocco, Mozambique, Namibia, Niger, Nigeria, Senegal, Sierra Leone, South Africa, rice Edwards Island, United Republic of Tanzania, Tunisia, Uganda, Zambia, Zimbabwe and 12-nautical miles into the Home Zone countries associated coastal waters. Latin America Home Zone covers Mexico, Central America, the entire South American continent and the coastal waters up to 12-nautical miles from coasts of these regions but explicitly excludes the Caribbean. * Most Global prepaid vouchers have a maximum carry-over period of 3 years, though the 3000-minute and 5000-minute global vouchers have a 4-year maximum carry-over period. ** There is a small percentage of instances where the geographic restriction of making calls will extend or retract from the Home Zone Region listed above. Therefore, calls may be interpreted by the Iridium system as originating from outside the designated Home Zone Region and thus will be restricted from placing calls. Service availability is not guaranteed in these instances. *** There is a Middle Eastern and North African (MENA) Regional Prepaid Card. If this card interests you, please call. The MENA Home Zone covers Latin America (as shown) and 12-nautical miles into the associated coastal waters of the following countries: Algeria, Angola, Benin, Botswana, Burkina Faso, Burundi, Cameroon, Cape Verde, Central African Republic, Chad, Democratic Republic of the Congo, Djibouti, Egypt, Equatorial Guinea, Eritrea, Ethiopia, Gabon, The Gambia, Ghana, Guinea, Guinea-Bissau, Juan De Nova Island, Kenya, Lesotho, Madagascar, Malawi, Mali, Mauritania, Mauritius, Mayotte, Morocco, Mozambique, Namibia, Niger, Nigeria, Senegal, Sierra Leone, South Africa including Price Edwards Islands, Tunisia, Uganda, United Republic of Tanzania, Zambia, Zimbabwe, Cyprus, Jordan, Kuwait, Lebanon, Oman, Saudi Arabia, Turkey and United Arab Emirates. Q: does the sim card work even in older iridium sat phones? A: Yes - this sim card will work in all of the older Iridium Satellite phones. Simply denote the phone that you have in the comments section of the order as the older 9500 requires a FULL SIM card while the 9505, 9505A, 9555 and others only require a sim CHIP. Q: When is the prepaid sim card activated? Can I contact you at any time to activate it? A: SIM cards are normally shipped active, but we can ship you an unactivated SIM at no charge, standard US Mail. Then, you would need to complete an online store order at OutfitterSatellite.com for a RELOAD with whatever denomination of voucher you would like loaded. In the comments field, list the SIM card number sent to you for confirmation. If the order is completed on a business day, activation normally can take place within a few hours. For evenings and weekends, your card would be activated the following business day. If you wish to receive an unactivated SIM, follow this link and fill out the form selecting Sim Card for Later Activation and we can get that off to you.